What’s the Future for Spanish in the US? Before you begin working your way to foreign language fluency, it helps to understand the culture behind the language you’re learning. After all, language exists to help a group of people express their ideas and beliefs. Spain is an old country with a rich history and culture. As you begin your Spanish language program, gaining a strong grasp on this history, the values, and the etiquette will help you rapidly achieve success. 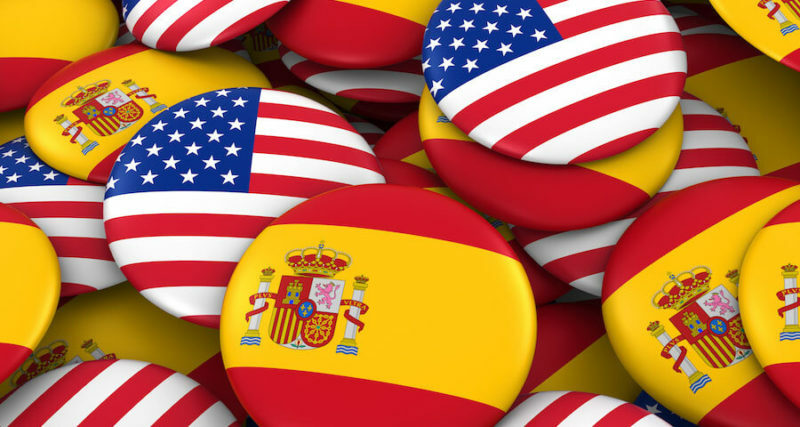 In particular, with the US home to more the second highest population of Spanish speakers in the world, it’s important to know the role Spanish plays in American life and culture. The US is made up of people hailing from countries all over the world. While English is the predominantly spoken language in the US, Spanish follows closely behind it. This is because so many people that live in and visit the US speak Spanish as their first or second language. When considering the Spanish speaking population of US, over 41 million of these citizens list Spanish as their first and native language— about 13% of the country’s population. Of the Spanish speaking citizens that are not native Spanish speakers, 12 million of these U.S. citizens are bilingual, and this number continues to grow each year, as more and more people immigrate to the country, as well as those that are taught Spanish in their homes. Many Americans who don’t already speak Spanish are trying to learn the language. As the most popular language for students to study in the US, 50% of college students in the US choose to study Spanish and 70% of grade level students are required to study Spanish. Whether people choose to learn Spanish in school or on their own, more Americans are realizing the value of knowing the language. In many areas of the US, the population is diverse enough to where the majority of the demographic speaks Spanish. Additionally, in these cities, many companies are more likely to hire individuals that are bilingual. Thinking of the US, it is hard to believe that any language other than English was ever considered the primary language. Today, English is the most widely spoken language, in the US, but it wasn’t the first. As history tells it, the first European settlers to North America were actually native Spanish speakers. In 1512, Ponce de León arrived with other Spaniards to found St. Augustine, Florida. Today, St. Augustine is recognized as the oldest European Settlement to be continuously occupied in the US. In 1508, Ponce de León founded San Juan, which became the oldest city in a US territory in 1898. In 1819, Florida joined the US with the Adam-Onís Treaty, after being owned by the Spanish. Many of these settlers had ancestors from Andalusia, Cuba, and the Canary Islands, thus becoming American citizens once the treaty was enacted. Throughout history, the international population of Spanish speakers increased because of the annexation of lands that were claimed through land purchases, wars, and claims by the Spanish Empire. This is a major reason why Spanish is so prevalent in countries all over the world. As people in the US consider immigrants and citizens that hail from other countries, it is helpful to keep the history of this country’s ties to the Spanish language alive. Spanish stands as the second most spoken language in the US, after English. Over 37 million of its citizens speak Spanish, making it one of the world’s fastest growing languages. Since 1989, the number of Spanish speakers has increased 233%. The growth of the Spanish language in the US is mostly a result of population growth and immigration. When it comes to non-English languages, Spanish is the most spoken throughout non-Hispanic homes in the US. Additionally, Spanish television networks have continuously received higher ratings than English speaking networks. As studies show, the current amount of Spanish speaking Americans will rise by 2020, as it is expected that there will be around 39 million to 43 million Spanish speakers in the country. These numbers are assuming that the population of Spanish speakers will increase because of the immigration of native Spanish speakers, as well as speakers that have become bilingual after learning Spanish as students. Many people have moved from Latin America to the US, and many others are still migrating. However, there are concerns about these people because there are over 35 million US citizens who identify themselves as Latin-American, but only six million are known to be working legally. Another six million people of Latin American descent live and work in the US without formal papers. Moreover, there are also concerns from the families of those who cross the border about the treatment they receive given their status and American stereotypes associated with the Latin Americans. The Latin Americans usually migrate to the US mainly for economic reasons. Most of them believe there are better well-paying jobs in the US, which means that they can earn more money and send some back home to improve the lives of their families. However, most Latin Americans opt to cross the border illegally because of their financial situation, and illegal crossing is usually a perilous process. The journey involves dangerous paid people-smugglers and can end prematurely due to the harsh conditions faced when trekking through the hot desert. Anti-migrant vigilante groups and drug dealers along the borders are also a considerable threat to the migrants. Those who get to the other side can find jobs, and if they are lucky enough can send something back home. However, living as illegal immigrants is problematic because of the looming risk of arrest and deportation. For the immigrants to maintain a low profile, they must make do with menial jobs and often go for years without seeing their families. There are also risks to their health that are difficult to treat since going to doctors can result in deportation.